As Morris settles into its third quarter century (founded in 1912) it is a distinct pleasure to see it marque (!) the occasion by the presentation of this fine car which will no doubt help take the venerable firm forward into the late 70s and thus also help it compete in what is an increasingly competitive market. Traditionally the car for Everyman, Morris have always been renowned for their road-holding and endurance and, of course, the straight-six engines found under the regal bonnet of vehicles such as the Morris Six. Formerly under BMC control, and now a part of the modernised British Leyland group, Morris’s latest offering replaces the much-loved 2200 but it carries over the important features of front-wheel drive and the same fine engines. As such, the 2200 HL clearly pays homage to the cars familiar to so many for many a long year. So, the important question now is what the 2200 HL is like to own and drive. It may say “Morris” on the front grille, driver’s steering wheel and boot but is it a Morris underneath too? It is certainly a distinctive car showing that Morris is keen to challenge the likes of the delightful Citroen CX which has been on sale for most of this year not to mention the elegant but flawed Peugeot 604. 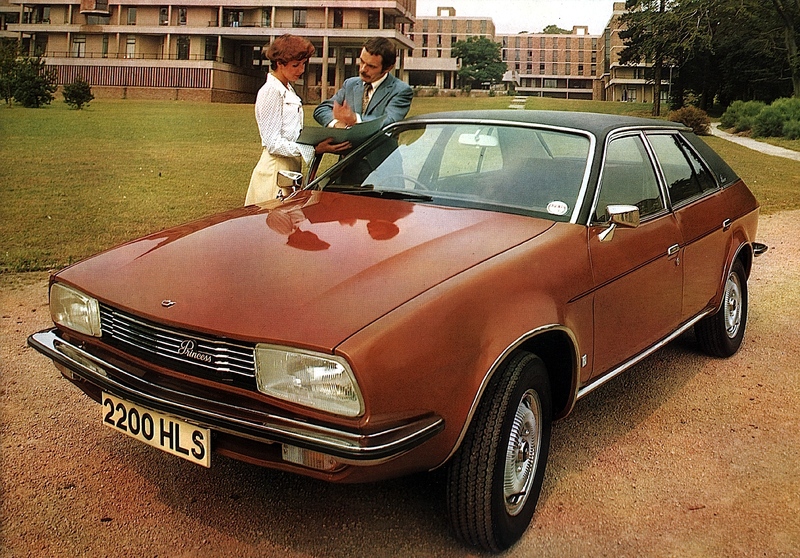 Morris have cleverly positioned the 2200 HL between the Ford Cortina and Ford Granada in terms of size and luxury. Curiously, although it looks like a “hatchback” it is in fact a saloon, like Citroen’s recent entrant in the market. Perhaps some prospective buyers will find the Morris’s appearance very attractive indeed. It is to be hoped. The 2200 HL is a little smaller than a Vauxhall Victor FE too – and somewhat bigger than a Viva so one can see that the Morris is positioned so as to attract customers willing to pay a little more for quality and luxury and who are prepared to sacrifice a little exterior length. On the inside, practical Morris punches above its weight: robust vinyl upholstery and stout trim combine to create an ambience of remarkable usefulness, redolent of the austerity of BMW’s acceptably decent “Five” cars. Morris customers will appreciate details such as the well-placed and commodious ashtray, a slot for a radio, window winders and comfortable, broad seats which are not that bad. So, in terms of its static characteristics, the 2200 HL more than upholds the traditions of the venerable Oxford marque. Readers might be wondering about the model name. It simply refers to the engine displacement. The 2200 is a six cylinder engine, of course. And the 1800 is a modern push-rod four, for drivers keener on economy than on performance. The cars are available with a four-speed manual but a Borg-Warner automatic is planned for 1979. I tested the six-cylinder manual. I took the Morris on a touring route starting in West Butterwick (near Scunthorpe), on to Hatfield, north to Rawcliffe Bridge, to Goole, Goole Fields and Swinefleet by the grey, great Humber estuary and then up the Trent back to West Butterwock. It is a good touring route, by the way, with many opportunities for sampling local food and beers. The Half Moon afforded a good place to stop after a long day’s driving and their ales, served by their jolly barmaid, make up with quality and ABV what they lack in range. It is a fine pub, the Half Moon, and for various reasons I have had cause to stop there several times this month and the Morris fits very well into the carpark, so redolent as it is of English country life. Broadly, the 2200 is a smooth and comfortable car, closely matching Citroen’s standards but also offering a choice of a six where the French make do with a four. There is a touch of understeer at higher cornering speeds – a draw with the Citroen. The Morris 2200 HL has a gearbox which could do with some revision though the flexibility of the six means drivers won’t need to stir the ‘box too much. The fuel consumption is almost acceptable too – the shortness of the road-test meant I was not able to check up on the Morris figures. They claim 28 mpg and I would not be moved to disagree. All in all, the 2200 is a good car: both modern and traditional; very much a Morris and a without a doubt a challenge to Ford and Vauxhall too. Not quite sure why Archie Vicar warrants the description “legendary”. . . and that test-route of his, though still a pleasant drive, is flat as a pancake and presents no challenges to even the most mediocre of cars. For that is what the 2200 was: mediocre. Claustrophobic in comparison with the also flawed, but still superior, Issigonis barge which it replaced. My boss had one at the time, which I occasionally drove when he had imbibed a little too much at lunch. These journeys were mostly in the Peak District of Derbyshire and once the length of the M1 from London to Sheffield. I recall it as comfortable enough, an adequate cruiser, but with nasty blind spots and a wallower on twisty roads. All in all, symptomatic of a manufacturer desperately trying to dig a way out of a hole. This really made me laugh! I knew about badge engineering, but badge writing was new to me. I just wondered how it was possible for Citroën and Peugeot to improve their cars so much in only two days. The ‘awkward’ CX becomes the ‘delightful’ CX here. Okay, whatever Archie…..
Wasn’t the ADO71 equipped with unusually narrow rims in relation to tyre width in order to improve slow speed comfort? Archie double-dipping in the manner of freelance correspondents from time immemorial. Isn’t this car a trio, though? It’ll be enlightening to read the Austin review, and the Vanden Plas Princess from the following year would merit a weekend stay at the Half Moon with the consumption of many high ABV brews along with a cigar or ten to accompany the Craven A cork tips and a pint of Madeira when the casks run dry on Sunday night. BMC E series traverse inline 6. Traverse inline sixes are very unusual, basically because they are too long. The only recent application I know of is Volvo, which was in much larger vehicles and required a unique transmission to fit. I get that BMC was trying to create 4 and 6 cylinder engines that could be machined on the same tooling. That is an efficient way to do things, and inline engines are cheaper to build – only one set of cylinder heads, cam drives, manifolds, simpler blocks etc. And an inline 6 is perfectly balanced. The problem is that when you want to install an inline 6 traverse, you end up with a set of engine design compromises to make it shorter in order to fit. In the case of the BMC E series, bores smaller than ideal, longer stroke than ideal, siamese bores… etc. So what you end up with is a compromised design 6 that may give you an advantage in a FWD format, but is substandard compared to competitors installations in longitudinal 6’s. Also, the derived 4 is taller because of the longer stroke, so the hood height ends up taller than ideal on your smaller cars. And the 4 cylinder is going to be rougher, noisier and have a more limited rpm range. BMC vehicles using the E series ended up with an inbuilt disadvantage for both the 4 and 6 engines vs the competition from the getgo.